Available in 14″ – 30″ models with Briggs and Kohler motor options. Drive Speed: 0-200 feet / min. Available in 14″ – 20″ models with Honda and Briggs motor options. Drive Speed: 0-80 feet / min. Flextool SP1180FT is a versatile, heavy duty walk behind saw. Perfect for a wide variety of applications, complete with the following features. Powerful Honda Petrol engines with cyclone air filtration system. Simple design for easy maintenance. Rigid Steel Box Frame for strength/accurate blade tracking. With the optional Vac unit you can easily transform it into a dry cutter that generates minimal dust. 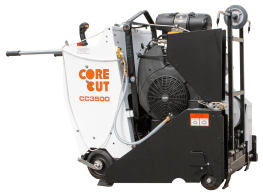 Unlike other electric cutters, the blade rotates forward, cutting into the material efficiently with minimum effort from the user. 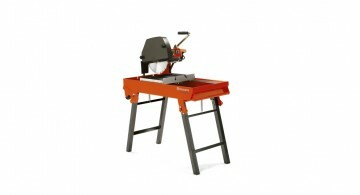 Compact and robust 3.2 kW cut-off saw with a 350 mm cutting wheel for use on all types of jobs. The innovative long-life air filter system with cyclone air routing ensures an extremely long filter service life and increases service intervals. 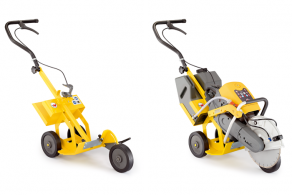 Low-vibration levels make working with this model less strenuous. Can be operated by hand or together with an FW 20 cart. Powerful 5.0 kW cut-off saw for 400/416mm cutting wheels. 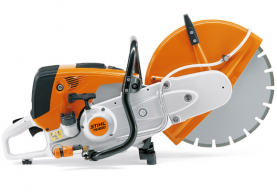 The most powerful Cut-Off Saw in the STIHL range for cutting metal, concrete and asphalt in commercial applications. Extremely long filter service life and increased service intervals thanks to its innovative long-life air filter system with cyclone air routing. Can be operated by hand or together with an FW 20 cart. The STIHL FW 20 cart turns all hand-operated STIHL cut-off saws into easily manoeuvrable cutting machines. 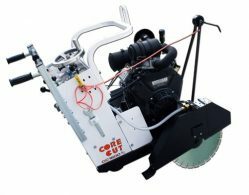 Convenient depth adjustment allowing the cut-off saw to be easily mounted on the cart and cut height adjusted by means of the upper handle. Comes with ‘Attachment kit with Quick Mounting System’. 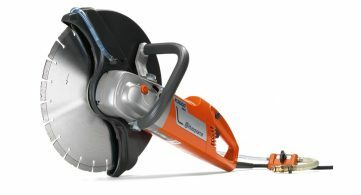 The Husqvarna K 970 features a unique power-to-weight ratio. It has the new Active Air Filtration™, one of the market’s most efficient centrifugal air cleaning systems which assures minimum motor wear even in the dustiest enviroments and SmartCarb™, a built-in automatic filter compensation as well as a highly efficient vibration dampening system. The K 970 is equipped with an X-Torq®engine, which reduces emissions up to 75 % and lowers fuel consumption by 20 % and DuraStarter™, a dust-sealed starter that boosts reliability and product life. It has a new ergonomic rear handle with hand-friendly controls and is designed to rest well against the body. 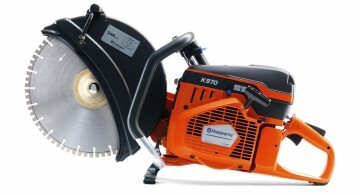 The K 970 is also ideal for heavier cutting of concrete and stone in alterations, renovations and new construction. It is perfect for cutting smaller holes and adjusting window and door openings, as well as for pipe, asphalt and metal cutting. 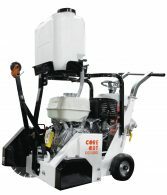 It’s also ideal for cutting of curbstones and pavers in landscaping. 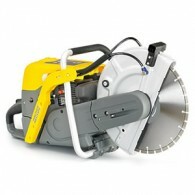 This is an efficient universal masonry saw with high cutting capacity for all construction materials. The single-piece frame with integral raceways gives great rigidity and increased protection against impacts. Two rear wheels make for easy transport on floors. One person can easily set up the machine, thanks to the semi-automatic foldable legs. The quick disconnect system makes the water pump easy to replace. Very sturdy and rigid frame with protected guide rails. Can plunge or cut at 45° for maximum versatility. Longreach Brick Saw goes the extra mile for those special cutting jobs. Sawing large blocks and stones is a breeze with the K-Saw Longreach. •Designed for portability and strength. A 3mm laser cut and folded structural steel frame is fitted with structural cross members to provide maximum rigidity. • Spring Loaded Cutting Head! A must for the operator’s safety! Over 20 years of ICS product innovation and experience culminating in the latest addition to their gas saw family. 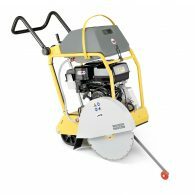 Everything that makes chain saws the preferable method in cutting concrete, stone, and masonry wrapped in a hungry, power filled package called the 695F4. 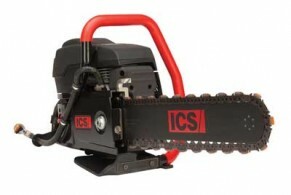 All the great features from past ICS chain saws plus a few new innovations to make your day go a little easier. Deep, straight cuts and square corners with ease of use and dependable performance to match. If cutting concrete, stone, masonry or ductile iron pipe is your game – the ICS 695F4 is your GAME CHANGER. 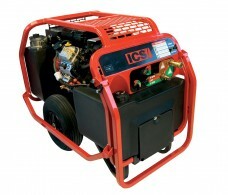 Step up to the power of the newest addition to the ICS® line of reliable powerpacks. Adjustable to 8 gpm or 12 gpm (30 lpm or 45 lpm) operation. Wacker Neuson Push Along Trolley. 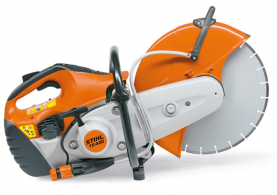 Suitable for newer model saws, please phone CDTA to ensure your saws compatibility. The machine always remains balanced when lifted by the central lifting point. This ensures that the rear wheels always touch the ground first and not the cutting blade. Makes the transport of the machine easy and user friendly. Wacker Neuson’s walk behind saws are no compromise machines designed and built for hard work. The new BFS1350 is a powerhouse, combining excellent cutting performance, compact dimensions and a light design. 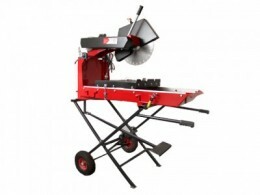 With a powerful and reliable engine this is an excellent saw for nearly all your cutting needs. The BT. 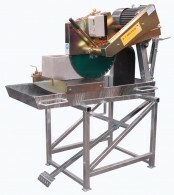 electric bricksaw is the flagship saw in this industry, its design is user friendly and is made out of quality materials, making it the perfect choice. 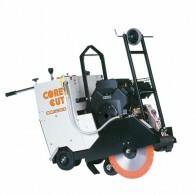 It comes with a powerful 1700W electric motor so it is ideal for all your cutting applications. The BT. 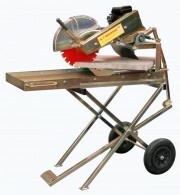 petrol bricksaw is the flagship saw in this industry, its design is user friendly and is made out of quality materials, making it the perfect choice. 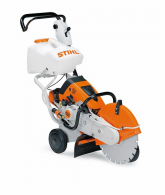 It comes with a powerful 5.5 Hp Honda GX160 motor so it is ideal for all your cutting applications. The BT. 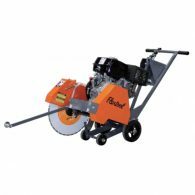 paver saw is the flagship saw in this industry, its design is user friendly and is made out of quality materials, making it the perfect choice. It comes with your choice of a powerful 1700W electric motor or Honda GX160 5.5 Hp Petrol motor, making it ideal for all your cutting applications. Optional 16″ blade capacity, ask our experts for more information. The BT. electric / petrol block saw is the flagship saw in this industry, its design is user friendly and is made out of quality materials, making it the perfect choice. It comes with your choice of either a 4Kw, 3 phase motor or 2.2Kw 240 volt electric motor. 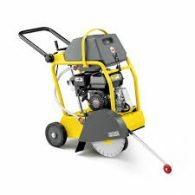 Alternatively a Honda GX270 9Hp petrol motor can be used making it ideal for all your cutting applications.